NZ Transport Agency has launched a second long form commercial, “Blazed”, as part of the drug driving awareness campaign started with “Shopkeepers” in August. Research in New Zealand showed the road safety agency that the main drug people admit to using and then driving under the influence of is cannabis. Experts from the community, such as convenience store owners, fish and chip shop workers and the chldren of the target audience. “Blazed”, shot by Taika Waititi, director of 2004 short film “Two Cars, One Night” and 2010 feature film “Boy”. 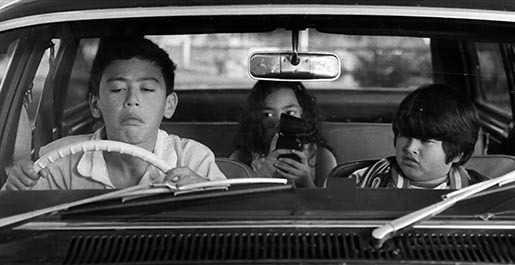 Three Maori boys find themselves in a situation familiar to most kids growing up in New Zealand – sitting outside in the car, waiting for one of their dads to come out and drive one of them home. The only thing is, the dad has been blazing, and the kids know it. We watch them change from comical to contemplative, as they examine their own awareness of their dads’ behaviour in the raucous, imaginative way only young boys can. Recent research from the Drug Foundation in New Zealand found that Maori men and women were over 50 percent more likely to have used cannabis in the previous year than men and women in the general population. So while this campaign is targeting a broad New Zealand audience, it is specifically targeting Maori through a separate TV ad and programme integration deliberately developed for Maori, via Maori TV. Shopkeepers talk about the drivers who come into their shops stoned. Some people think that if they’re a bit stoned, driving slower will make them safer. Trouble is, cannabis slows your reactions. So are you really safe to drive? This campaign launched on 18 August 2013 with media targeted at specific television channels and shows, cinema and online sites that are popular with people in their thirties and forties. The Drug Driving campaign targets people in their thirties and forties who use cannabis, many of whom believe they’re okay to drive after using cannabis. In all other respects of their life, they don’t take risks and consider themselves to be ‘sensible stoners’ who enjoy using cannabis on a regular basis as opposed to people who use greater amounts of cannabis more frequently. Their own experience tells them that they’re okay to drive after using cannabis. Some think the drug has little effect on their driving. They even believe that the drug makes them a safer driver as they feel more focused and drive slower when under the influence. They have never considered their behaviour to be a road safety issue. The Drug Driving campaign was developed at Clemenger BBDO, Wellington, by executive creative director Philip Andrew, creative director Brigid Alkema, art director Tony Haigh and copywriter Dan Moth (Shopkeepers), art director Mark Dalton and copywriter Mike Gwyther (Blazed), planner Thomas Scovell, director of social marketing Linda Major, agency producers Je Gasson and Marty Gray, account team manager Bethany Omeri, working with NZTA advertising manager Rachel Prince, principal scientist strategic directions Paul Graham, senior advertising advisor Victoria Slade. Shopkeepers was filmed by director Robin Walters via Curious Film with director of photography Chris Mauger and producer Matt Noonan. Post production was done at Blockhead by VFX artist Nigel Mortimer and Curious Film. Editor was Cushla Dillon. Colourist was Pete Ritchie. Sound was produced at Coopers of Franklin Rd. Filming for Blazed was shot by director Taika Waititi via Curious Films with executive producer Matt Noonan. Colorist was Pete Ritchie. Post production was done at Blockhead. Sound was produced at Liquid Studios by composer Peter van der Fluit, sound designer Craig Matuschka and producer Tamara O’Neill. Media was handled at OMD by business director Annabelle Wilkinson and account director Emily Goulden. Maori TV sales executive was Toni Urlich.